The Washington Area Music Association, better known as WAMA is an umbrella organization uniting musicians, concert promoters, entertainment lawyers, recording engineers, managers, graphic artists, and others working within the DC music industry. Among WAMA's programs and benefits they are probably best known for their annual Wammies music ceremony, in which awards are given (in all genre's) to WAMA members, who are nominated and voted on by WAMA members. WAMA also put's together and distributes a membership directory, WAMA Pages, sends out frequent e-newsletters, and provides you with a membership card. The annual cost to become a WAMA member is $35. In order to attend the Wammies there is an additional $30 cost per attendee. But in my opinion the money you dish out is well worth the networking. Creating positive productive habits and remaining steadfast in them is one of the keys of long term success. Write 2 to 4 bars everyday and you will have a new song every month; a solid album every year. Work out every day, even if it's just for 30 mins. and you well remain fit. Never drink and you will completely avoid hangover's and the many mistakes people make when intoxicated. Now create the habits that will take you there. Washington, DC, Maryland and Virginia (aka the DMV), has long been recognized within the music industry for the amount of noteworthy talent it has managed to give the world. Artist's such as Duke Ellington, Marvin Gaye, Tori Amos, Timbaland, and most recently Optimo and Fuego have all had their starts in the Capital City. 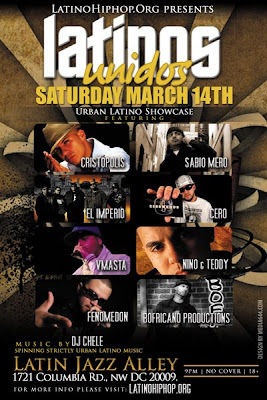 Continuing this trend of cutting edge remarkable talent, I have organized an Urban Latino Showcase for March 14, 2009 which features some of the DMV's best talent. 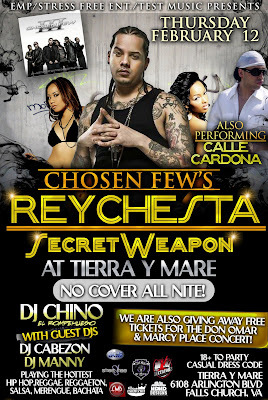 This is a show not to be missed. Elizabeth Gilbert recently gave this talk on our cultures perception of creativity and the struggles that artist's go through. This incredible talk was given at the TED Conference. In this video Seth Godin, best selling author and writer of the #1 marketing blog in world, shares with us some of his insights.